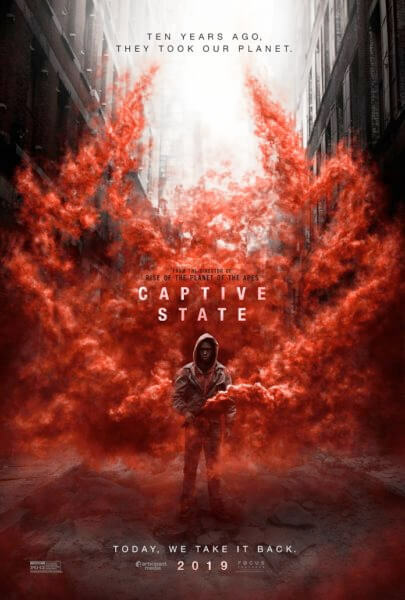 The first teaser trailer for Captive State declares “the state of our Union is strong.” The world in which the film takes place records unemployment as the lowest rate in history. Poverty has been completely eradicated, and crime no longer exists. But life is not idyllic in this universe as aliens have taken over the world and control humanity, with the trailer providing brief glimpses at what happens to those who don’t conform to the new world order. The sci-fi thriller comes from Rupert Wyatt (The Rise of the Planet of the Apes, The Escapist, The Gambler). Wyatt directed the film and co-wrote the script with Erica Beeney (The Battle of Shaker Heights). He also served as a producer along with David Crockett. The cast of the PG-13 rated drama includes John Goodman (The Conners), Ashton Sanders (The Equalizer 2), Jonathan Majors (White Boy Rick), Colson Baker (Roadies), and Vera Farmiga (Bates Motel). Wyatt’s behind the scenes team includes director of photography Alex Disenhof, editor Andrew Groves, production designer Keith P. Cunningham, and costume designer Abby O’Sullivan, with music by Rob Simonsen. Focus Features will release Captive State in theaters on March 29, 2019.